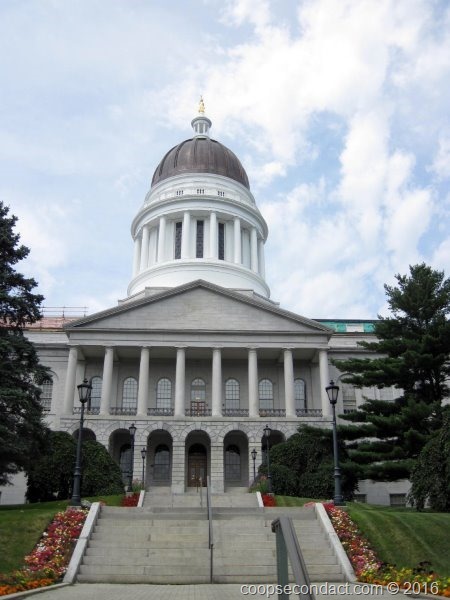 From here we drove north to Augusta, the state capital of Maine. Augusta, on the Kennebec River, was designated the capital in 1827. The original capital was in Portland but they decided that a more central location was needed. Interestingly, the Supreme Court remained in Portland although the court travels and hears cases in other parts of the state. The capitol building was built and first occupied in 1832. Since then it has been substantially remodeled and expanded but the original structure and many original elements remain. On another day we made a day trip to Portland, Maine’s largest city. 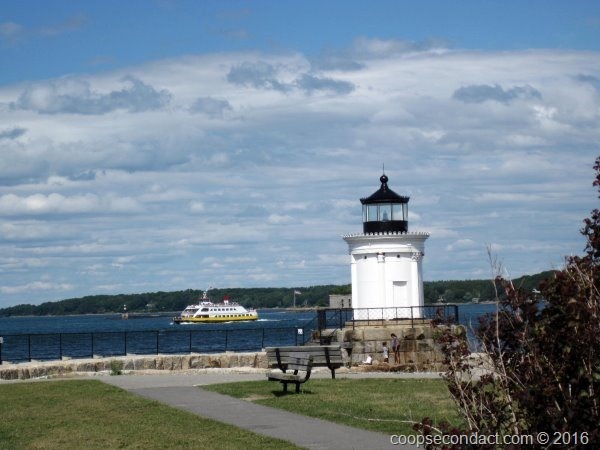 The city was born on the waters of Casco Bay and it has a very appealing waterfront that is still a working port. In addition, around the bay there are 7 lighthouses, reminders of Maine’s long time connection to the sea. During World War II, South Portland’s shipbuilding industry became a major producer of “Liberty Ships” which were used to ship supplies around the world to bring food, ammunition and other items to support the US troops. At one point, there were 30,000 workers employed in this effort and they could complete one of these massive ships in 50 days. A total of 236 Liberty Ships and 30 “Ocean” cargo ships for the British were built here between 1941 and 1945. To round out our visit we went to the historic city of Bath, located at the mouth of the Kennebec River, the same river that runs past Augusta. Bath is a very pleasing small village with a nice riverfront. There is also a long history of shipbuilding here with Bath Iron Works, founded in 1884, which is still a major economic force for Bath and the surrounding area. Since 1995 it has been a subsidiary of General Dynamics. During its history it has built mostly destroyer class vessels plus some cruisers and battleships.